Description: Copenhagen. City plan. Decorated with ships, rose, and stunning panorama. Coloured. Title: : The Northern Expedition. Description: Coloured Chart of the Straits of Copenhagen, showing the area of operations of the British Fleet under Nelson and Hyde Parker. 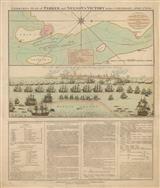 Description: Fascinating broadsheet of The Battle of Copenhagen during the French Revolutionary Wars. Map and illustrated battle plan of the attack and description published 22nd April 1801. Original Colour. Description: Meyer's famous and highly attractive rendition of Copenhagen, showing the city within its walls with a traditional panorama on the lower border. Coloured. Title: : Monuments de Celebres Navigateurs et Heros Maritimes - Statue de Niels Juel a Copenhague. Description: Decorative map showing the Copenhagen Sound and a view of the Statue of Niels Juel. Description: Stunning map of Denmark including the Duchy of Holstein. Original colour. Description: Map of Funen, the third largest island in Denmark. Coloured. Description: Map showing the Northern portion of Jutland. Coloured. Description: John Speed's exquisite map of Denmark embellished with miniature city views along the upper border and costumed figures on both sides. English text on verso. Strong impression. Description: Attractive map of Denmark and part of Sweden embellished with the vignette of a ship. Coloured. Description: Detailed map of the island of Funen in original colour, embellished with several ships and a large cartouche. Description: Coloured map of Central Jutland. 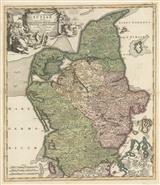 Description: Map of Denmark with ornate cartouche. Coloured. 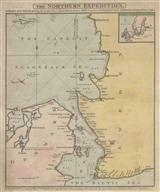 Description: Striking map of Jutland with large figurative cartouche. Good impression with original colour. Description: The Kingdom of Denmark together with its possessions in what is now southern Sweden.